Four campsites are located along the Pine Canyon Road, a short road accessed from the Glenn Spring Road. The Glenn Spring Road and Pine Canyon Road are maintained for high-clearance vehicles ONLY. Please do NOT attempt these roads with a normal passenger car. Deep arroyos, and heavy ruts are the norm. After heavy rains, these roads may become heavily rutted and possibly flooded. Always check with a ranger for current conditions. Ruts are the norm on this road. Ask a Park Ranger for the latest road conditions. None available. Thicker vegetation occurs as you the farther up the canyon you drive. The thickest vegetation is found near PC-4. 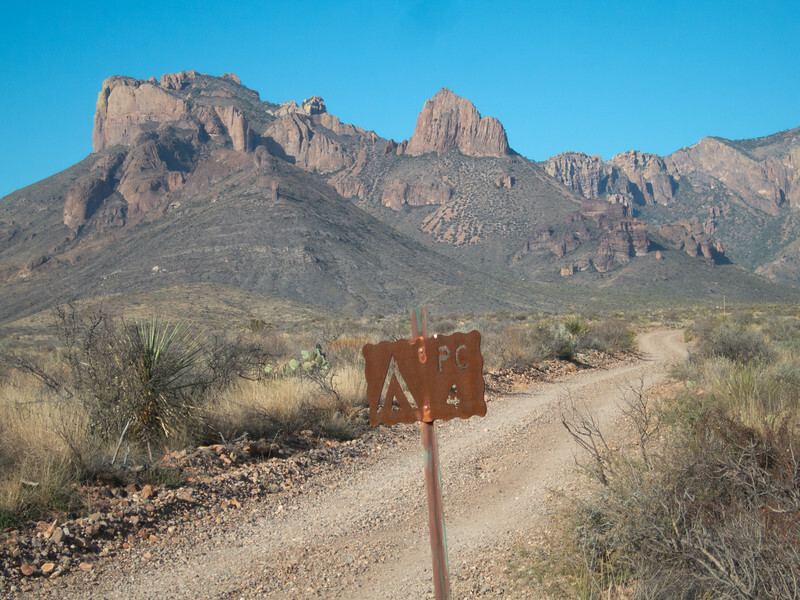 Good view of the Chisos Mountains from all campsites, especially PC-1,2,and 3. Views of Crown Mountain to the south of the road. The entire Pine Canyon area and the Pine Canyon Trail are very scenic. At the end of the road (near PC-4), a trail continues for two miles up-canyon and ends at the base of a high pour-off that becomes a fantastic waterfall after rains. The road can deteriorate rapidly after rain. High clearance vehicles are highly recommended at all times, and 4-wheel drive may sometimes be necessary, especially after rain. Hikers using the Pine Canyon Trail (day-use only) will park their vehicles at the end of the road in the designated parking area. Lock and secure your vehicle and valuables while you are away from your campsite. The Pine Canyon #4 Campsite was relocated March, 2002 in order to alleviate parking congestion at the trailhead area. The current location is down the Pine Canyon Road approximately .5 miles. At the end of the Pine Canyon Road a gate closes the road. The Pine Canyon Trail begins at this point. There is no overnight camping allowed at the trailhead parking area. A backcountry use permit is required (available at visitor centers). Campers are responsible for regulations listed on the permit. Camping is in designated sites for minimal impact on the surrounding vegetation. The NPS website has some updated information. Pine Canyon 1 (PC-1), Pine Canyon 2 (PC-2), Pine Canyon 4 (PC-4) and Pine Canyon 5 (PC-5) can each accommodate 2 vehicles, 6 people, no horses. Pine Canyon 3 (PC-3) can accommodate 1 vehicle, 4 people, no horses. Pine Canyon primitive roadside campsites are located along the Pine Canyon Road via the Glenn Spring Road. Pine Canyon Road begins 2.3 miles from the junction of the Glenn Spring Road and the main road to Rio Grande Village. The Pine Canyon Road is 4.2 miles in length. Glenn Spring Road and Pine Canyon Road are maintained for high clearance vehicles only. Roads are rocky and may become rutted or experience wash-outs, especially after heavy rains. Check with a ranger for current conditions. No shade at these sites. Vegetation is sparse grasses and lechuguilla. 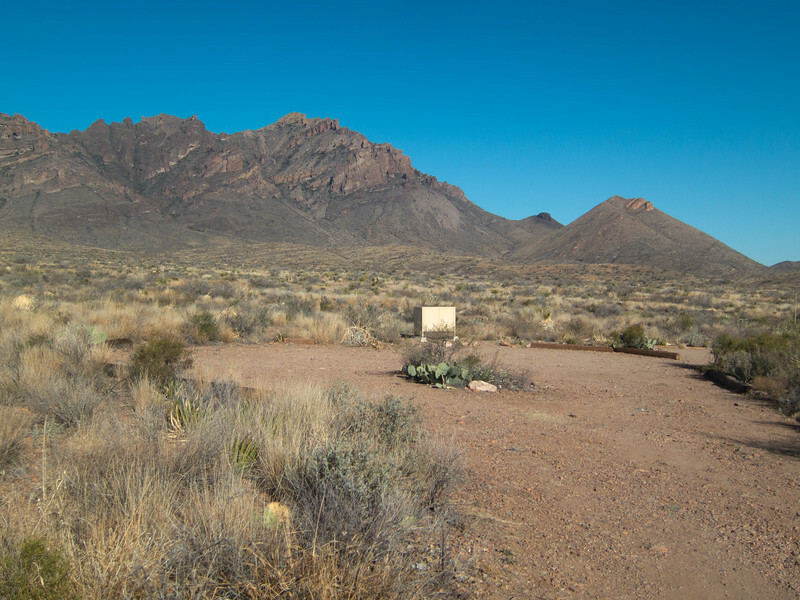 Great views of the Chisos Mountains from all sites. Views of Crown Mountain and the Sierra del Carmen are especially scenic. Day hikers may park vehicles near the gate at the end of the road. The area may be frequently visited throughout the day. Lock and secure your vehicle while away. Pine Canyon trail, located at the end of the road at the old gate, is easy for the first mile and a half. The last half mile of trail is difficult and steep over loose gravels. The trail ends at a waterfall that flows only after a rain. The canyon is named for its ponderosa pines. The forest is a relict of the last ice age. You travel to see things differently. This was my favorite site from our trip. Great views of the Chisos, quiet and secluded. 5/5. www.virtualbigbend. com - now mobile friendly! Visit the state-of-the-art virtual tour of Big Bend National Park!